Surgical Hyperhidrosis treatment nowadays is becoming more and more expensive. If you still don't know what hyperhidrosis is, it's a condition where your sweat glands are uncontrollable and this abnormal situation causes you to sweat a lot. It's basically about genetics. But, if this is your present condition, there are many available hyperhidrosis treatment that you can choose from. There are two basic ways to treat hyperhidrosis. First is through surgical methods and second is through natural methods. To start with, it is advisable to go for natural methods first in hyperhydrosis treatment before going into the more drastic solution of having a surgery. One of the common complaints of people who are suffering from hyperhidrosis is sweaty palms. 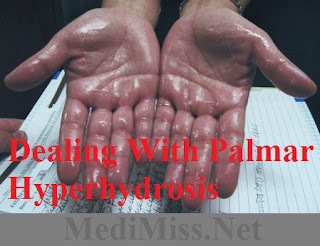 One form of hyperhydrosis is the Palmar Hyperhidrosis or excessive palm sweating. In medical terms, it is known as Palmar Hyperhidrosis. What is Palmar Hyperhidrosis? It is commonly known in plain English as sweaty palms, wherein your palms profusely sweat. Even in cold season, Palmar Hyperhidrosis occurs. It means that much sweating is only affecting one area of the body, the palms. There are situations that palm sweating is accompanied by excessive sweating of other parts of the body, like the feet, forehead, cheeks, and armpits. Sometimes, and in worse case scenarios, it's the whole body that sweats a lot. Our palms naturally sweat and it's normal that when we engage in sports or typing or any kind of hand activity, palm sweating might be triggered. However, Palmar Hyperhidrosis is different. Even after your hands are not busy with any activity, or even if it's cold, your palms sweat a lot. Excessive palm sweating means a profuse perspiration above normal body's thermoregulatory needs. It is due to our sweat glands that are overly sensitive to temperature and becomes hyperactive. 1. You experience your hands feeling clammy and perspire more than normal. Sometimes, it results to dripping sweat and it's very annoying when you have to shake somebody's hand. 2. The temperature of your palms compared to your other body parts are notably higher. 3. Your skin seems to peel when you excessively sweat. It's different from scaling but it's more close to exfoliating. 4. After the excessive sweating of palms, extreme dryness of palms is experienced. To teenagers it normally starts during their puberty period, as there are hormonal changes that happen in their bodies. There are some secondary effects involved with Palmar Hyperhidrosis. It could be psychosocial effects, where the sufferer may have difficulty in mingling with people due to low self-esteem cause by hyperhidrosis. They are more reluctant to partake of socially expected activities like simple hand shaking or touching their loved ones. There is also difficulty in holding objects or gripping tools and things. Others have difficulty in typing because of sweaty palms. Some become really depressed because even in simple activities like holding a pen to write a check is difficult.